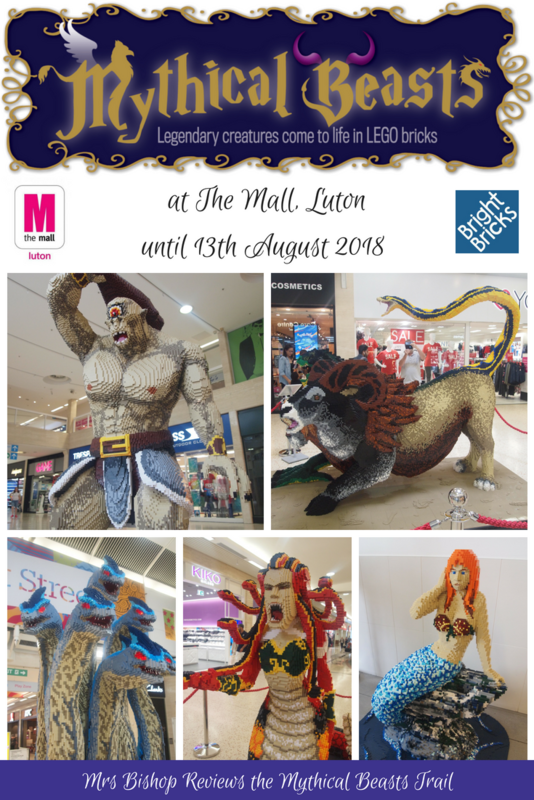 Pandora's box has been opened at The Mall, Luton this summer, releasing mythical LEGO beasts into the Mall. The Mythical Beasts LEGO brick trail by Bright Bricks contains an amazing selection of giant Lego statues from the six-headed Hydra to Pegasus the winged horse, this exciting new LEGO trail challenges you to track down the escaped beasts which are placed around the Mall, for a chance to win LEGO prizes! 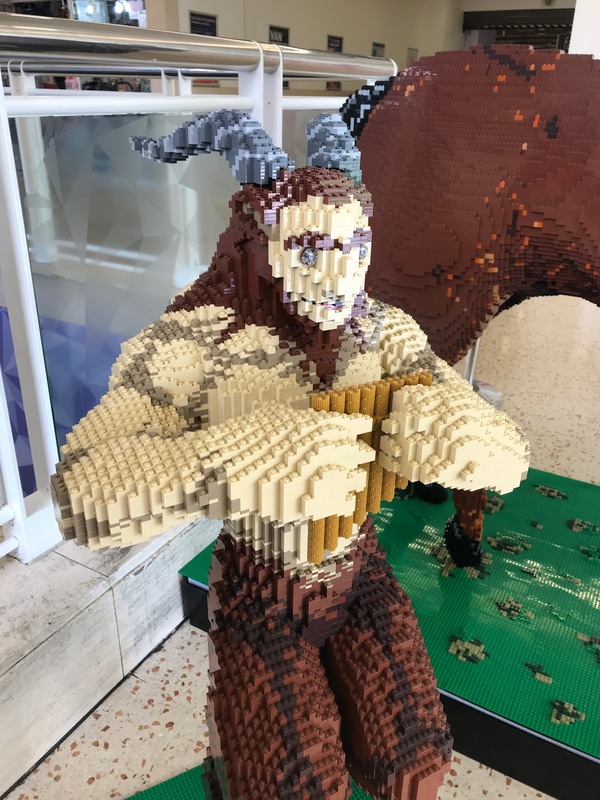 Yesterday we headed down to The Mall, Luton to be the first family to see the statues, and we were very kindly treated to a VIP Tour of the Mythical Beasts from a Bright Bricks builder, Shawn, who was able to tell us everything we needed to know about these amazing LEGO builds and how they are created. I'm so excited to be able to share our morning with you - and I urge if you live locally to get yourself down to the Mall as soon as possible to see this amazing collection of LEGO sculptures. The Mythical Beasts trail started yesterday (31st July 2018) and is on until 13th August. It is totally free of charge, and you can get a trail booklet for your kids from the Mall's customer services desk which not only helps you to locate the beasts but also has questions to answer on each sculpture as you go around - if you answer all the questions and hand in your booklet at the end, you get a little free gift from The Mall, as well as being entered into a prize draw to win Legoland Windsor tickets! Bert and Liam were so mega excited about the trail, they are both huge LEGO fans, and can often be found squirrelling away many hours building LEGO masterpieces at home. I can confirm that the sculptures are MESMERISING - I defy anyone not to be impressed by their sheer size, their incredible details and vibrant colours. We literally saw people from all walks of life stopping in their tracks in the Mall yesterday to take in the impressive beasts. I had a long conversation with a woman in her 80's who thought they were just amazing - so it really is for the whole family, Granny included! The menacing Hydra - this sculpture even had sound effects!! The first stop on our trail was to see the six headed Hydra - each Hydra head has a name - from left to right they are called Hamilton, Hansel, Harold, Harry, Harvey, Horace and Horatio! It took a team of 6 builders 122 hours to build, using 177,000 bricks! It is said that no blade can slay the beast, as for every head cut off, the Hydra grows two more in its place. According to legend, one was once seen with a hundred heads!! The detail on this statue was incredible, I especially loved the skin pattern down the Hydra's back, and it's lizard-like body, just amazing! As a lover of Greek Mythology I recognised many of the creatures on the trail, and I enjoyed telling Bert some of the stories as we went round - it felt like a rites of passage recounting tales of Medusa, Hydra and Pegasus! The back of the six headed Hydra - what amazing detail! A character that Bert was familiar with was of course, Hercules (thanks to the Disney classic!) and he loved posing as the legend himself on this amazing interactive mosaic piece. This piece is 2D (unlike the other 3D sculptures) and is made up of thousands of flat LEGO tiles. It took a team of 4 people 23 hours to make, using 28,295 bricks! I was in awe of the detail - especially the definition of Hercules' muscles - it truly is a work of art! Shawn our tour guide explained that when you build a mosaic piece like this you have about 15 seconds to move a piece before the glue dries - then your only option if you need to change a tile is to chisel it out! Crazy! Next we moved on to perhaps the scariest of all the models - Stheno the Gorgon! Stheno is the sister of Medusa - she was the oldest and most terrifying of the gorgon sisters, Stheno and Euryale began a formidable campaign against the gods and their champion after her mortal sister Medusa fell at the hands of the hero Perseus. Like Medusa, any mortal who meets Stheno's gaze is turned to stone! Bert was in awe of her many snake heads, and Liam and I particularly enjoyed the attention to detail in the Greek-patterned tiled floor plinth she stood on. Bright Bricks really have thought about every aspect of these statues and the work that goes into them is astounding. One of my favourite statues in the collection was The Mermaid (The Little Mermaid is one of my all-time favourite Disney films!) and I thought the colours used in this particular model were breathtaking, even the rock she is sitting on contains a beautiful array of colours from white, blacks and greys, to beige's and greens - giving a really defined and realistic finished look. Shawn told us that they weren't permitted to use red hair for the mermaid, as it would be too close a copy to Disney's Ariel, but I loved her fiery ginger hair! She also has the same face structure as a model of Rey from Star Wars that Bright Bricks made for a Star Wars film premiere - this definitely piqued Liam and Bert's interests as they are major Star Wars fans! Bert is a little too young for the Harry Potter books and films, so he was yet to hear about a Phoenix - he was intrigued to learn all about the bird that can burst into flames and has magical tear drops. Akaara the Pheonix took a team of 2 builders 94 hours to create, using 25,260 bricks! Bert read out the sign attached to the Phoenix statue (there's one attached to each statue with facts, figures and a little background on the creature) and was fascinated to find out that a Phoenix is never born, and will never die, their lives are an infinite cycle of rebirth. Connected to Life itself, even mighty hydras cower from a Phoenix's thunderous squawk! WOW! My absolute favourite of the whole trail was the MASSIVE Cyclops! Oh my goodness, it is HUMUNGOUS! It carries a huge club, and looks as if it is about to bring it down and bash you on the head with it! It must look even more impressive to little children. Again, the detail is staggering - I loved looking at the facial details, the accessories and clothing he wears and even his disgusting feet! We were hugely impressed to discover that this Golden Fleece (one of the smaller of the models, which are placed inside some of the Mall's shop windows, rather than in the Mall floor space itself) was actually created by our very own tour guide Shawn! He was able to tell us all about the process of making it, which was just fascinating to hear! Isn't he talented? Puts my LEGO model building to shame! Haha! I think the most beautiful of all the statues was Rhea the Pegasus (winged horse). The simplicity in terms of colour was a stark contrast between the exceptional detail that has gone into building this amazing horse. With enchanting piercing blue eyes, and even eyelashes (!) I could have stood and marvelled at her for ages. She took 4 people 85 hours to build and used an impressive 81,320 bricks. That's a lot of LEGO! As we went round The Mall, Bert loved finding out what the questions were on the trail booklet - and with his new found reading skills since starting school, he was able to read the signs and find out the answers for himself - he did find the large numbers a bit of a challenge though - as he can only count to one hundred! Ha! It was a lovely way to tie the trail together and keep the children interested in reading the signs and (without realising it) learning such interesting facts about these amazing sculptures and their place within ancient mythology. The most vibrantly coloured model was Aello the Harpy - she took 2 people 47 hours to create, using 21,500 bricks! Did you know that Harpies are snatchers by trade, thieves on behalf of the gods? No trinket, tool or mortal is beyond the Harpies' well-honed kidnapping skills, and there is no heist tasked to them that they have not accepted with glee! Aello the Harpy took 2 people 47 hours to create, using 21,500 bricks! Bert loving getting up close and personal with a Harpy! The final pair of statues we saw on our VIP Tour was Chiron the Centaur and Teb the Satyr - who are placed together in this exhibition. These half man/half beast characters worked brilliantly well together and I loved how they differed so much in size but not in splendour! Chiron the Centaur and Teb the Satyr: Mythical Beasts by Bright Bricks. Teb the Satyr: Mythical Beasts by Bright Bricks. We adored every moment of this magical mythical tour, and it was made all the more special because we enjoyed it with the company of Shawn, who as a Bright Bricks builder, was able to give us so much behind the scenes detail into the making of the models, and what life as a bonafide LEGO statue builder is like. Never mind how impressed Bert was, I think Liam is GENUINELY considering a change of career! Following the tour we were treated to a yummy brunch with The Mall Luton team, and the kids (and Liam!) got to enjoy a LEGO building session with Shawn as their mentor. Bert was definitely inspired by the Mythical Beasts statues, and he got so creative with the LEGO making his very own mythical beast! Not bad for 4 years old! Bert and his mythical LEGO beast! It was lovely to get hands-on with some LEGO after seeing so many amazing sculptures throughout the morning - we followed some step by step LEGO instructions and built some really cool monsters together which was so fun! I honestly think you're never too old to enjoy being creative with LEGO bricks! Even Connie was introduced to building with LEGO for the first time (she's only 2!) - she loved popping the tiny eyes on and spent a good ten minutes sat on Liam's lap saying very clearly over and over again "MORE EYES DADDY!". Albert was so pleased with his LEGO creation, and he very proudly showed it off to Shawn, who was so wonderful with him, and very encouraging, telling him that it was good enough to become a real life LEGO builder when he is a grown up! Cue beaming smiles from my little man! Albert and Bright Bricks builder, Shawn. What a marvellous morning - and how happy we were to have been lucky enough to be invited down to enjoy such a well thought out and impressive exhibition. 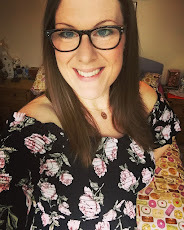 If you are local to Luton then please do head down to The Mall and give it some love - it's the perfect way to keep the kids happy during summer holiday shopping trips, and is worth a visit solely to see the exhibition, even if you don't need to shop! Yeah it was really so sweet and Bert got so creative, much more so than usual! Looks like such a fun exhibition! Who doesn't love Lego?! Exactly! Lego will just never go out of fashion, eh? They look absolutely incredible. I'm still such a LEGO fan, even at 35. 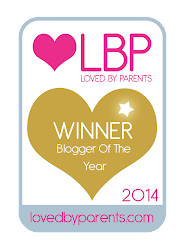 Beautiful write up! Thank you so much! Ahh I would really recommend it if you have one nearby! That's what we said about how they knock them up in just a few days, amazing skills! Wow, those pieces really are intricate. And I wouldn't want to mess with Stheno!